Few things are better than a girly summer trend. Remember loving those feather extensions back in 2011? How about last summer's cutesy manicures? This year's trend, of course, is the best. Girls of all ages --present company included--are obsessed with colorful Rainbow Loom bracelets. 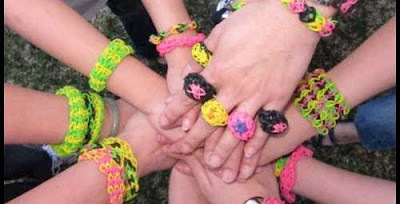 These springy rubber band bracelets are akin to the traditional sleepaway camp friendship variety but the designs are even more elaborate because of the loom from which they are created. The aforementioned loom is more like a peg board device that allows you to create a variety of patterns and designs with colorful rubber bands and a crochet-like hook. The best way to learn new patterns to watch the approximately 130,000 tutorials by children on YouTube. If you don't have a a niece or little sister, you can always find the perfect bracelet on eBay or Etsy. Prices generally range in the $1 to $5. We suggest, however, trying the loom yourself. It's so much fun and like any good summer trend it's poised to be over in about six months. By then, times tables will have replaced this temporary distraction.